Significant focus on infrastructure asset delivery and lifecycle must become a priority so that architects, engineers and construction (AEC) can leverage BIM systems for design, construction and management solutions. 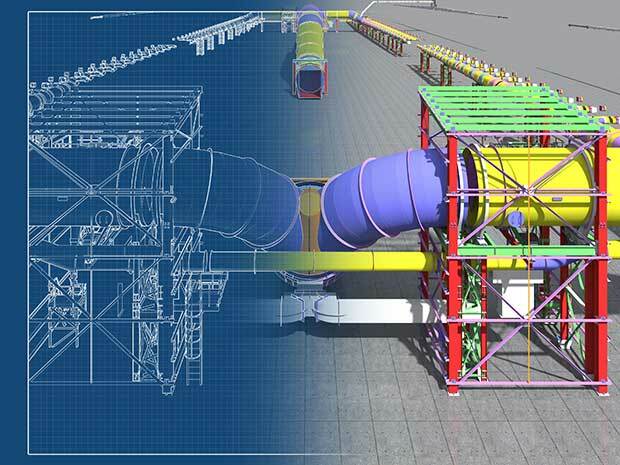 Innovations in BIM applied to infrastructure construction projects will enable “smart” solutions. This article explores BIM for infrastructure insights and brings attention to closing the BIM divide between the vertical (buildings) and the horizontal (linear) infrastructure industries, such as roads, bridges and pipelines. For smart systems to be applied to infrastructure, CAD needs to evolve to the point where those multi-dimensional models can integrate with geographic information systems (GIS). The larger the project, the more necessary it is for a seamless data transition from the local engineering scale to the municipal, regional or national reference systems. Autodesk defines building information modeling (BIM) as an intelligent 3D model-based process that gives architecture, engineering and construction (AEC) professionals the insight and tools to more efficiently plan, design, construct and manage buildings and infrastructure. It is like a GIS in many respects, but applied locally to a structure. It is able to do many common geospatial calculations. It is still an evolving technology, but it is clear that soon it will do for AEC and facilities management what GIS did for surveying and cartography. Systems have evolved augmenting our abilities with built-in applications that can integrate connected data and systems to enhance and extend our capabilities. These systems are termed smart, which has become the newest marketing buzzword. Everything is getting the smart label. Along with the label is an expectation that the lines between the physical and the digital worlds are blurring as we slip ever nearer the veil wherein we will simultaneously co-exist in both worlds. Smart also infers it is connected to the digital cloud, that seemingly infinite expanse measured by petaflops, into which artificial intelligent algorithms augment everything with contextually aware information overlaid atop our own experience of the world. Of course, this view has its pitfalls and cautionary tales, and every step we take into the future we lose some connection with the past. For example, everyone can use a calculator, but are times tables even taught anymore? Automation leads to complacency. Let’s take a brief look backward. The year was 1978, my second year of high school. I took drafting class as an elective and would end up doing so for the rest of the time I was in high school, accumulating enough credit hours to graduate with a vocational degree equivalent in architectural design. Those were the days of drafting tables, slide rules, French curves, triangles, keen eyes and steady hands. The last year of school, there was talk of something called computer-aided drafting or design (CAD) that would make all we were doing obsolete. It seemed impossible at the time. Especially after I took a brand-new summer course called computer programming. Computers were large, heavy, clunky things that had limited abilities. They were basically responsive text machines. Program something in BASIC, save it, and then from the DOS command window, run it over and over again. I remember reams and reams of green and white paper two foot wide fed by geared teeth, and pages of pages of our coded programs that we would have to pour over looking for the mistake in the line of code. And, this long and lengthy code was merely to archive and sort information or make the computer draw a cat or some other object using “X”. We would all stand around the dot matrix printer as line by line the image took shape on the printed page. There was that wondrous feeling of success creating something having first conceived it in the mind then, like digital-smiths, forging it in a non-physical space and holding it in our hands. But I could not understand how that blinking white cursor on a black screen could ever replace the rich colors and smoothed lines of the beautiful architectural drawings I had spent years learning. I felt confident the stories of our trade being overtaken by CAD were greatly exaggerated. That lesson taught me that change is inevitable and far beyond our rational ability to comprehend what is possible based on our current understanding. I watched as computer-aided design did take over, giving engineering and architectural drawings multidimensional context. Now, let’s jump back into the present. The horizontal industry is behind the vertical industry with respect to project management deliverables. In part, this disparity will be aided by the Geospatial Data Act which was passed into law on Oct. 5, 2018. The linear model is approximately 10 years behind the vertical model, especially for above-ground assets and facilities. However, recent technology advancements — augmented reality (AR), unmanned aircraft systems (UAS), indoor lidar and modeling software — and influential advocacy initiatives (such as public agency innovation programs like smart cities) are starting to enable digitally integrated management of asset information more holistically. Indeed, there is urgency for these linear systems to be adequately captured. The Feb. 6 explosion from a ruptured gas line in San Francisco showed the dangers of not having an adequate map of the subsurface infrastructure. 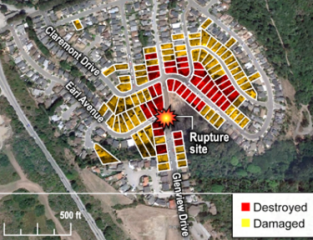 Fortunately, no one was injured, but damage from subsurface infrastructures can be deadly like the San Bruno disaster in 2010. The “Call Before You Dig” law was enacted for this very reason. At the very least, problems with linear infrastructure can negatively impact a city’s quality of life and budget such as a water main break or a broken sewer line. Looking ahead 5-10 years, horizontal infrastructure designers and installation companies will use 3D modeling tools as standard practice in an open data sharing environment allowing other networks to access the information and add it to their own projects. Imagine a county’s 811 system, the universal number to call before you dig, and instead of calling, it is an app on a users’ phone. A requester submits a short form and receives a text when the application is approved, usually within minutes, and is then able to view an augmented reality overlay of the subsurface infrastructure in the vicinity beneath the ground where the requester’s project is taking place. This approach has economic benefits, providing faster turn-around times, increasing citizen engagement and improving the safety of communities. Over time, it is a “collect once and use many times” system — it will reduce demand on city staff and billable hours, saving cities money. The same technology is also available for construction projects, providing schematics to see pipes, ducts and wires in walls, floors and ceilings. This is not science fiction. Existing condition data is already being collected in 3D, so it is logical to anticipate engineering design will be prompted to support ongoing 3D collection efforts and begin doing work in 3D. Using BIM from the outset of a project builds this into a system that can be accessed later. However, the use of these advanced augmented reality technologies are limited to certain geographic areas with enough funding and technical capabilities. This is primarily in large urban areas, new growth areas, and redeveloping areas of a city; however, large infrastructure projects such as pipelines, railroads, highways, bridges and hyperloops will have to develop high-resolution models that will capture some of the surrounding areas and benefit all communities along the routes helping to bridge the disparity of the BIM divide. In time, as costs come down and the technology improves and becomes easier to use, all communities will benefit from and incorporate this emerging technology. Critical to BIM for smart infrastructure is the fusion of sensors, data and infrastructure. Sensors will be embedded within and affixed to physical assets for the purposes of collecting data and self-monitoring for machine learning, maintenance and repair. Networking internet-enabled devices that actively and passively sense is at the core of the internet of things (IoT). Data from these IoT devices will improve physical asset management, creating unique opportunities for agencies, especially when considering how machine learning can discern patterns in data to detect anomalies, and improve safety such as self-aware systems that can heat road surfaces when precipitation is detected in below-freezing temperatures. The digitizing of the physical world will take place with greater demand for higher resolution capabilities. Physical structures will require an exact computerized replica, referred to as a Digital Twin. An effort is underway by the Open AR Cloud Organization (OARC) to create an open standard for this digital twin of the world, so that applications and innovation will not be hampered by proprietary systems. Yohan Baillot, CEO of ARcortex and founder of the Open AR Cloud, explained if there is no open standard, something developed in one system may not align with applications viewed in another system. This could be costly and disastrous for transportation and construction projects. Point in case would be the above example of Call Before You Dig,if a gas pipeline is incorrectly depicted and a work crew ruptured it. This Digital Twin is both a high-resolution GIS and a basemap for both vertical and linear BIMs to connect into. Knowing the location of subsurface assets is foundational to the increasing investment into smart cities, which is forecast to become a $3.5 trillion industry within the next seven years. David Rouse (2017) defines smart cities as cities that use information and communication technologies to increase operational efficiency, share information with the public, and improve both the quality of government services and public well-being. Using smart devices, communication among the devices and with the entities managing those devices provide deeper insight on device behavior and the ability to develop algorithms to change device parameters using other sensors in close proximity. All of this data can be used to optimize asset performance over time. In the U.S., San Francisco, New York, Chicago, Los Angeles, Boston and San Jose all have active smart city projects advancing connectivity (Nominet 2018). Intelligent infrastructure augments users’ abilities by the multiplicity of sensor arrays (self-monitoring devices, RFID, Wi-Fi, GPS receivers, cameras, etc.) communicating with decision-support systems as well as other sensors — the internet of things (IoT). For instance, high mast cameras combined with artificial intelligence algorithms for object recognition deployed along a stretch of highway allows stakeholders to extract important insights of that physical asset (such as surface condition, traffic flows and vehicle counts) and provide that information in real time to emergency response crews, police and security, maintenance vehicles, network-connected vehicles and others. V2I technologies capture vehicle-generated traffic data, wirelessly providing information such as advisories from the infrastructure to the vehicle that inform the driver of safety, mobility or environment-related conditions. State and local agencies are likely to install V2I infrastructure alongside or integrated with existing ITS equipment. The Open Connectivity Foundation (OCF) endeavors to provide open standards and certification to make connectivity easier, more reliable and more secure by bridging IoT ecosystems. Specifically, OCF specifications can be used to develop vehicle data model translators that enable remote fleet management for autonomous vehicles, OBD device interactions (vehicle performance monitoring) and crowdsourcing of data models for continued development (Open Connectivity Foundation 2018). Currently, many transit agencies are seeing growth in equipping rolling stock with IoT devices including GPS, Wi-Fi and traffic light preemption, which improves fleet optimization and data accessibility, and enables better congestion management as well as increased system performance (American Public Transportation Association 2018). Crowdsourcing data from web-based and mobile applications is a popular public engagement mechanism. Crowdsourcing at its most basic level is the aggregation of (big) data from a large group of people. From an asset management perspective, leveraging the general public’s direct and indirect collection of data brings deep insight into asset performance and condition. The data collected provides the ability to better plan transportation systems with demand modeling, predictive analytics, event response times to identify those impacted and determine where additional capacity is needed, and to provide personalized services (such as through email and text) including weather-related events impacting the commute. Applications such as Waze empowered the public with the ability to report hazards, construction zones and other concerns on the road and shoulder that DOTs can use to dispatch resources to address the situation/issues quickly. Furthermore, Alavi and Buttlar (2019) identified sensing capabilities of smartphones and their crowdsourcing power for monitoring several distinct civil infrastructure systems such as pavement. In summary, BIM for infrastructure overlaying a robust GIS plays a critical role for supporting advanced technologies for integrating dynamic IoT and crowdsourced data. Infrastructure asset owners are encouraged to recognize the importance of BIM-oriented policy and practices and invest in required initiatives that make incremental progress towards a smart infrastructure vision. BIM is the foundation of intelligent infrastructure and defines the backbone of smart cities. Alavi, Amir H., and William G. Buttlar. 2019. “An overview of smartphone technology for citizen-centered, real-time and scalable civil infrastructure monitoring.” Future Generation Computer Systems 93: 651-672. https://doi.org/10.1016/j.future.2018.10.059. American Public Transportation Association, 2018. 2017 Public Transportation Fact Book. Washington D.C.: American Public Transportation Association, 50. http://www.apta.com/resources/statistics/Documents/FactBook/2017-APTA-Fact-Book.pdf. Nominet. 2018. List of Smart City Projects. https://www.nominet.uk/list-smart-city-projects/. Open Connectivity Foundation. 2018. Open Connectivity Foundation Home Page. https://openconnectivity.org/. Rouse, Margaret. 2017. Definition: Smart City. July. https://internetofthingsagenda.techtarget.com/definition/smart-city. U.S. Department of Transportation. 2018. Vehicle-to-Infrastructure (V2I) Resources. https://www.its.dot.gov/v2i/index.htm. Jon Gustafson, PS, CFedS, PMP, GISP is a management consultant with one of the world’s largest professional services companies, WSP (https://www.wsp.com). He is an accomplished business-oriented technical professional consistently recognized as an industry leader in multi-jurisdictional land surveying practice, geospatial policy development and program/project management. He helps his clients address infrastructure technology deployment challenges by developing effective recommendations/guidelines focused on advancing civil integrated management practices and innovations. Some recent projects include developing data governance strategies for major infrastructure programs, conducting applied research on digital project delivery initiatives, advancing UAS integration, and formulating geospatial technology strategies for a public agency. Tewelow is a former intelligence specialist with the U.S. Navy. He also served a special assignment at the U.S. Department of Transportation and is currently a manager with the U.S. Federal Aviation Administration.